There are a wide variety of factors that go into putting together a one-day Disneyland itinerary. Even assuming you want to visit every ride once, things like crowd levels, FASTPASS availability, temporary closures / refurbishments, and your personal ride priorities all come into play. 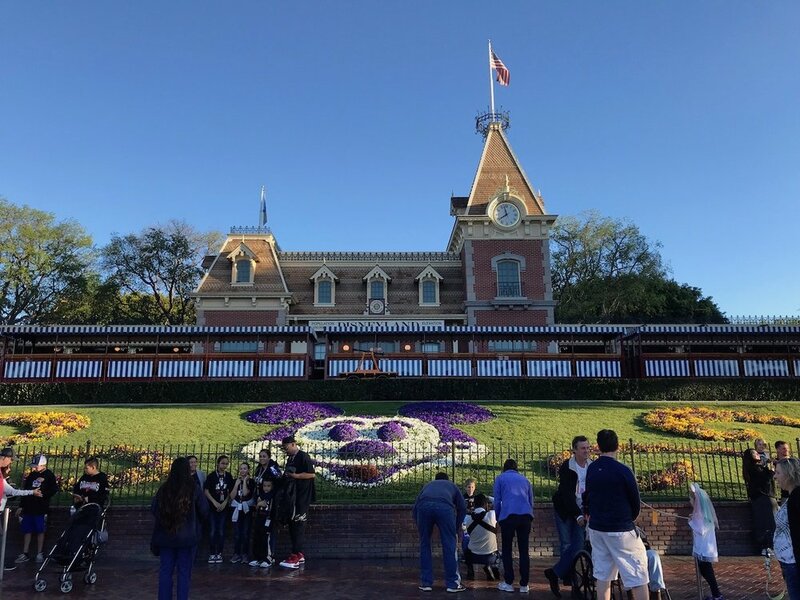 The good news is that by arriving early—check out our post on rope drop at Disneyland park—and using FASTPASS—check out our post on FASTPASS and MaxPass at Disneyland—you’ll be in good shape to visit all or most rides on everything but the most crowded days. This post has four sections. First, we start with quick tips and related posts on touring Disneyland. Second, we explain the different elements that go into planning your day—rides, entertainment, and characters. Next we begin the actual itinerary—we break the day into different sections, providing an overview and sample schedule (from an actual visit) of each section. Finally, we provide you the entire minute-by-minute schedule we used on that visit. This post covers Disneyland park only. It does not include Disney California Adventure. You can check out our one-day Disney California Adventure itinerary here. We’ll start with a few tips for touring Disneyland. First, you won’t do everything. Can you ride every ride at Disneyland in a single day? Yes. Often easily. Can you experience everything Disneyland has to offer in a single day? No. There’s too much entertainment, too many characters, too many attractions that require decent amounts of time, and a park that’s too complex and beautiful to be taken in quickly. Our example itineraries—and our strategies generally—are very rides heavy. Keep that in mind if other things—particularly characters—are important to you. Second, four rides have single rider lines. Space Mountain, Indiana Jones Adventure, Matterhorn Boblseds, and Splash Mountain have single rider lines that will allow you to ride with a shorter wait. Groups will be broken up (that’s the point, after all), but it’s a good way to double up on some fun rides. Rides sometimes stop issuing Single Rider passes if they get too busy. Third, rides go down. Be prepared for things to break down or to open late during your visit. Most of the time you’ll just have to rearrange your schedule. Our example schedule contains several occurrences of this. There’s more than rides in Disneyland. Putting together your itinerary requires that you pay attention to rides, characters, entertainment, and anything else that goes into your day. Before we move on, we’re going to outline these elements. Depending on exactly how you count, there are around 29 rides at Disneyland, plus several other non-ride attractions. If you’d like to learn more about these individually, we have a complete guide to the rides of Disneyland. Ten of these rides utilize Disneyland’s FASTPASS system to allow you to skip the lines. We always recommend starting your day with the same three rides at rope drop. In addition, there are several “leisure attractions.” These are attractions with short or no waits where you can relax a bit, sometimes in the shade or indoors. The leisure attractions are: Sleeping Beauty Castle Walkthrough, Walt Disney’s Enchanted Tiki Room, The Disneyland Story Presents Great Moments with Mr. Lincoln, Main Street Cinema, Main Street Vehicles, The Disney Gallery, Mark Twain Riverboat, Sailing Ship Columbia, Tom Sawyer Island, the Toontown Play Areas, Tarzan’s Treehouse, and the Star Wars Launch Bay. Our itineraries don’t include character greetings. There are a few reasons for this. First, we don’t often visit characters. Second, character appearance times tend to vary greatly. Third, everyone has different characters they have to meet, so it’s silly for us to pick a few we might like and squeeze them into our plans while leaving others out. The best source for information on meeting Disneyland characters is the Disneyland app. The app has an entire section devoted to characters. Clicking through each character will tell you when and where to find them. Make a list of characters you want to meet and when you want to meet them. Fixed points are things that will happen (or that you will experience) at a specific time no matter what. Besides the obvious—park opening, your arrival time, meal reservations—you’ll want to look at the Disneyland entertainment schedule. The entertainment schedule is available both in the Disneyland app and in the physical Times Guide available at the park. Most events occur frequently enough that you can plan for them somewhat on the fly. Things like parades and nighttime shows will have only one or two occurrences, so you need to mind those carefully. Make a list of entertainment options along with some possible times to view them. Now let’s get to meat of the post—building your itinerary, along with a sample from a day we spent at Disneyland. We have a separate post on rope drop at Disneyland. We also have a separate post on Extra Magic Hour and Magic Morning at Disneyland. This post assumes there is no Magic Morning or Extra Magic Hour the day of your visit. We always recommend starting with Peter Pan’s Flight, Alice In Wonderland, and Dumbo. These are three rides with waits that quickly jump up and that do not have FASTPASS. For your first FASTPASS, we recommend Space Mountain. As we’ve written in our separate post on FASTPASS at Disneyland, we suggest having MaxPass for at least one day. Your second FASTPASS should be for Matterhorn. Remember, during the early hours you’ll be planning to get on your FASTPASS rides as late into their windows as possible, allowing you to get on as many short waits as possible. That’s fourteen rides. Typically, we’re happy if we get through the top seven—leaving the mid- and low-priority rides for later. 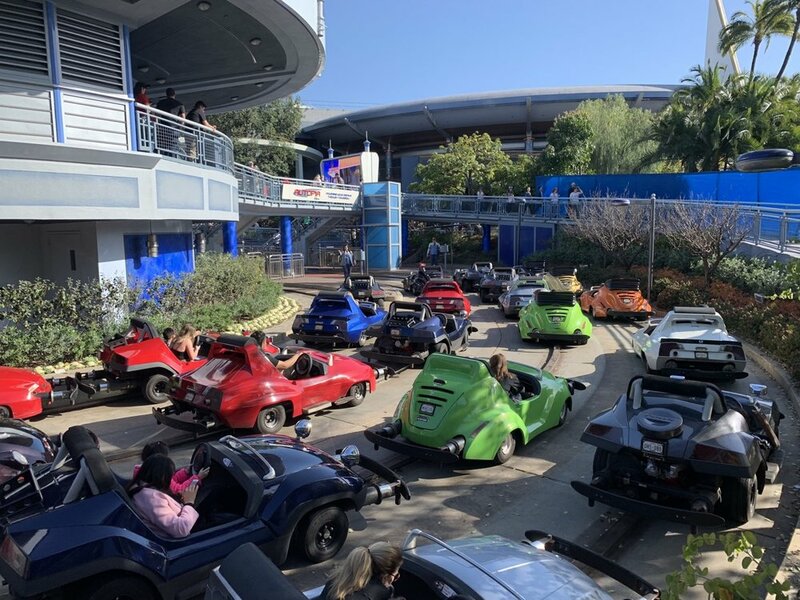 We try to push Autopia as late into the morning as we can—waiting for its wait to get to 10 or 15 minutes—because it can have a long unload time and is located relatively remote. Conspicuously missing from this list is Finding Nemo Submarine Voyage. Simply put, we’ve never felt it’s worth it to force this long ride into your morning. Because of the high concentration of rides over in Fantasyland and Tomorrowland, it usually won’t make sense to leave that area until about two hours into your day, having used two FASTPASS slots on Space Mountain and Matterhorn. But if you’re not so interested in the Fantasyland rides, you might avoid them in favor of riding FASTPASS rides like Star Tours, Buzz Lightyear, Haunted Mansion, Splash Mountain, Indiana Jones Adventure, and Big Thunder Mountain with short standby waits so you don’t have to worry about FASTPASS for them later. Here’s an example from a day we spent at Disneyland. Astro Orbitor was being refurbished this day. FASTPASS activity is bolded. About two hours into your day, you’ll want to expand your horizons to include the rest of the park—Adventureland, Frontierland, New Orleans Square, Critter Country, and maybe Toontown. Between 10AM and Noon you’re looking to just fit in as many short waits around the park as possible. Even thought we’re typically 10AM coffee break people at Walt Disney World, in Disneyland we try and have coffee and a snack before we arrive and then push our first break of the day closer to noon. This is basically when the park is “filling up” and short waits will start to be hard to come by. If you don’t like walking, your best bet will just be to visit more rides in Fantasyland. We prefer to try and tackle Jungle Cruise and Pirates of the Caribbean. As far as FASTPASS goes, we prefer to use our third one for Big Thunder Mountain Railroad. Most people favor Indiana Jones Adventure, and on busy days, or if you’re a huge fan, we think that’s fine. We find the FASTPASS queue for Indy takes too long, so we tend to push it into the afternoon. After that third one, just keep rolling with the Disneyland FASTPASS strategy, trying to grab whatever is next on your priority list or whatever fits well into your schedule. You’ll also want to grab a Fantasmic! FASTPASS during this time. The kiosk is located opposite the Big Thunder Mountain Railroad entrance, by the Mark Twain Riverboat entrance. As you can see, the unexpectedly long wait for Jungle Cruise sent us back to Fantasyland for some short waits. We often like to push those rides into the afternoon, but they’re good options at 5 minutes. This means our list of 29 is now down to 14, four hours into the 16-hour day. That looks like excellent progress, but it’s actually only okay. Unfortunately, now waits will be high and we have so much other stuff to do in the afternoon, including entertainment and leisure attractions. Hereon, we’re balancing four things—FASTPASS times, entertainment, “leisure attractions,” and standby waits. At lunch you’ll want to look at the times guide and entertainment schedule to start pinning down when you’ll be visiting everything. You also should make a list of rides you have left, dividing them into FASTPASS and standby. As a reminder, the “leisure attractions” are: Sleeping Beauty Castle Walkthrough, Walt Disney’s Enchanted Tiki Room, The Disneyland Story Presents Great Moments with Mr. Lincoln, Main Street Cinema, Main Street Vehicles, The Disney Gallery, Mark Twain Riverboat, Sailing Ship Columbia, Tom Sawyer Island, the Toontown Play Areas, Tarzan’s Treehouse, and the Star Wars Launch Bay. Finally, use the app to check the closing times on anything left that you want to do. Things can actually get quite tight at this time, with Main Street Vehicles often closing at 2:15PM and Sailing Ship Columbia often closing around 4PM. There’s no perfect way to do the afternoon. This really becomes more about priorities and what you’re willing to wait in line for. The time from 1PM to 4PM tends to be the most sluggish part of the day. You’ll be hot and a little tired (kids may be very tired). Lines will be long, and you’ll need to start checking off some pieces of entertainment. If you skipped the minor Fantasyland rides earlier, you may want to spend some time visiting those. If you’re not absolutely in love with them, though, push them late into the evening when they’ll have almost no wait. With crowds and heat at their highest, running around the park isn’t a good idea now. Try hard to plan chunks of your afternoon geographically. On the west side of the park you’ve got rides like Haunted Mansion, Splash Mountain, and Winnie the Pooh to balance with leisure attractions like Walt Disney’s Enchanted Tiki Room, Tarzan’s Treehouse, Tom Sawyer Island, Mark Twain Riverboat, and Sailing Ship Columbia. On the east side, you’ve got the rides of Fantasyland, Tomorrowland (including FASTPASS on Star Tours and Buzz Lightyear), and Toontown to balance with the Toontown Play Areas, Star Wars Launch Bay, the Fantasyland Theatre, and everything on Main Street. Whether you break for the early parade (usually 3:30PM) or the late parade (usually 6PM)—and keep in mind your day may only have one—just comes down to how the rest of your schedule works out. We don’t really have a preferences. Remember we said it would be sluggish? We started our day with 15 rides in four hours. In the afternoon we only managed six rides in six hours (along with other attractions and entertainment). That’s why rope drop matters. Evenings have the most rigidly fixed points of your visit because nighttime entertainment is typically only held once or twice a night. In the case of our visit, there was a 9:30PM show, Mickey’s Mix Magic, and a 10:30PM show, Fantasmic! When you see a schedule like that, you know you’d like to use a FASTPASS at 10PM. You can also plan on a few rides between 11PM and Midnight (the closing time of the park). Disney policy is typically to let you get in line for a ride anytime up until closing. In our case, we also already had two FASTPASS bookings for 8PM (Indiana Jones) and 8:35PM (Splash Mountain). Note: Never, ever save the best ride for last unless it’s a repeat ride. If an attraction goes down 30 minutes before close, there’s a good chance Disney will just close it for the night. Of our remaining eight rides, the only two we’d want to head to right after the parade would be Finding Nemo Submarine Voyage and the Disneyland Railroad. These are both close to the parade route and are really the least convenient rides (as far as wait times and ride times) we have left. It’s best to get the most problematic rides out of the way first. As we note in our instagram story chronicling this day, we actually skipped Fantasmic! and did the last three attractions during the 10PM hour. We rebuilt it like this for the convenience of the reader and because we don’t consider it a significant edit. This day really reminded us how challenging Disneyland can be. Ride breakdowns in particular really caused us problems. We had to push Alice In Wonderland late in the day, we wasted 35 minutes in line for Splash Mountain, and we had that small hiccup with Snow White’s Scary Adventures breaking. We also had issues with posted wait times being way off early in the day. The biggest failure of the day—not riding Main Street Vehicles—was a simple mistake. I’ve ridden and written about it dozens of times over the past few months, but today I just forgot about it. But even if we made a few better decisions, Disneyland is not a one-day park. We didn’t see the Disneyland Band. Both Astro Orbitor and Great Moments With Mr. Lincoln were not operational this day. We didn’t make it to the Fantasy Faire Theatre or Tom Sawyer Island, either. Could you get all the rides done in a single day? Easily. But once you start fitting in the entertainment, things get complicated. The times listed for rides at the time we entered the queue. We also give the posted wait time. For waits that were significantly different than posted, we’ll also indicate when we boarded the ride. I’ve bolded FASTPASS activity.